The Connection is the cornerstone of the wellness initiative at Twin Lakes. It is the benchmark facility for senior adults in the greater Cincinnati Area. The state-of-the-art facility emphasizes whole-person health and wellness by encouraging participants to develop and balance the six dimensions of wellness: emotional, intellectual, physical, social, spiritual, and vocational. access to everything you need to live a healthier life. will be provided when you consult with one of our Wellness Specialists. For more information please call the Connection at (513) 247-1330. 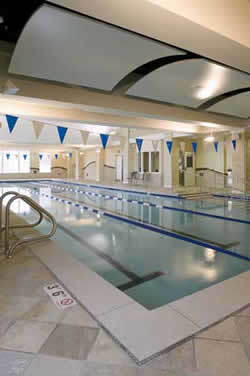 Our facility offers locker rooms with showers, restrooms and are fully stocked with towels, washcloths and hand towels. Aquatic area houses a warm-water pool kept at a comfortable 89 degrees, and a relaxing whirlpool.